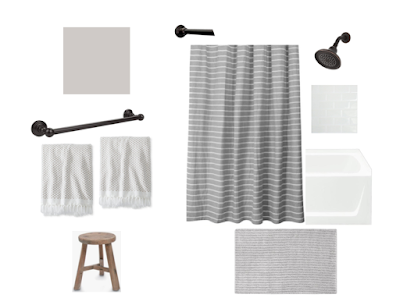 For today's Makeover Monday we will be going over the second and final design for our Hall Bathroom. This concept design will be for the two walls to the left of our previous post. Both of the walls will be painted light gray. I chose a simple light gray and white striped shower curtain so that it wouldn't over power the room but would still add a pattern. Both of the bathroom's in our house had just gotten new white subway tile in the shower before we moved in and I absolutely love it! We will be replacing the shower head, shower curtain rod and towel rack to an oil rubbed bronze to match the rest of the bathroom's hardware. Outside of the bathtub we have a light gray striped bath mat. To add some more texture to the bathroom I chose white bath towels that have a subtle gray honey comb pattern and tassels. Underneath the towel rack I decided to add in a wooden stool. It adds a bit a warmth into the room and adds a little more storage space. This room has such a simple color scheme and design I wanted to really play with patterns and texture to make it feel less plain. Overall I like how the designed turned out. Now we just need to get started! What do you like to add into a room to a jazz it up a bit?